Appearing in the wake of the superlative Ju 88, the Ju 188 proved itself an even better aircraft. It excelled as a bomber, torpedo plane, and reconnaissance platform but came too late and in too few numbers to have an impact. In 1939 the German Air Ministry announced specifications for a new high-speed bomber to replace the Do 17s and He 111s then in service. Junkers proposed a radical new design, the Ju 288, which was plagued with technical obstacles from the onset and never materialized. Meanwhile, the company also worked on the Ju 188 as a private venture in a logical progression from the already successful Ju 88. The new craft bore marked resemblance to its forebear, but it differed in having a new bulbous canopy section and longer, tapering wings. It also sported a power turret and squared-off tail surfaces. The first Ju 188 was test-flown in 1940 with excellent results, although its initial payload was the same as the earlier craft’s. Nonetheless, production commenced in 1942, and by war’s end 1,076 machines had been delivered. The Ju 188E was the first production variant and was employed as a radar-equipped torpedo-bomber. It functioned well and was possibly the best of its type during the war. They were followed by the Ju 188F, a high-altitude long-range reconnaissance version that performed useful work in Russia. By 1943 the bugs had been shaken out of the new Jumo 213A engines, and they were fitted to the dedicated bomber variant, the Ju 188A. These proved even faster and more versatile than the already legendary Ju 88s and were very popular with crews. Many were employed as pathfinders during the January 1944 “Little Blitz” against London. The final version, the Ju 188T, was a stripped-down reconnaissance machine that could reach 435 miles per hour at very high altitude. The Ju 188s were excellent machines but appeared too late and in too small numbers to improve Germany’s fortunes. In 1943, it was planned to upgrade the entire lineup with even more wing area and a pressurized cockpit for high-altitude work. A single basic airframe would be offered in three versions, the Ju 188J heavy fighter, Ju 188K bomber, and the Ju 188L reconnaissance version. All three did away with the under-slung gunner's compartment, leading to a cleaner nose profile, and the bomber and recce versions mounted their loads in a long pannier under the middle of the plane instead of the deeper fuselage of the G and H models. Simpler versions of these with no defensive armament and even longer wings became the Ju 188S fighter and Ju 188T intruder. With Jumo 213E-1 engines 2,050 PS (1,510 kW, 2,020 hp) at take-off and 1,690 PS (1,240 kW, 1,670 hp) at 9,500 m (31,400 ft), the Ju 188T could reach 700 km/h (440 mph). Operating at this altitude, the Ju 188S could carry only 800 kg (1,760 lb) of bombs. 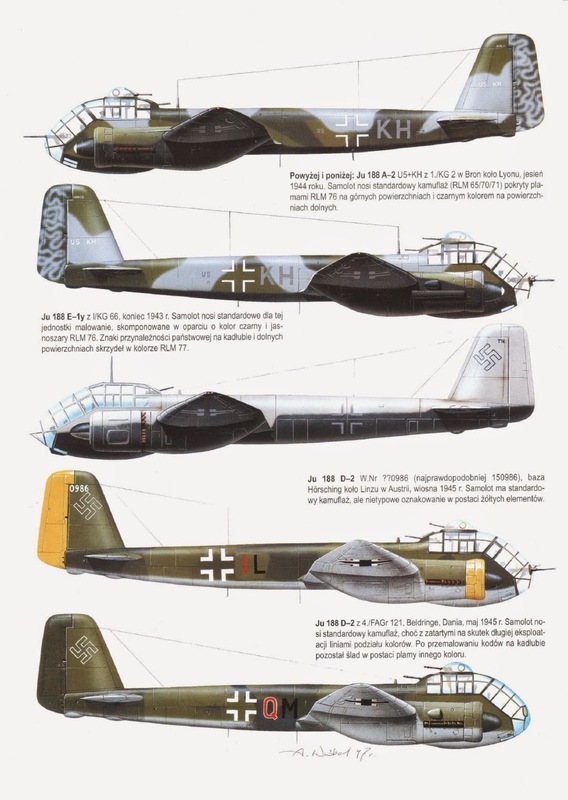 Before any of these could start production, the entire lineup was renamed the Ju 388, the vastly improved performance warranting this change in name. The Ju 188 was designed to be fitted with either the 1,750 PS (1,290 kW, 1,730 hp) Jumo 213A or 1,700 PS (1,250 kW, 1,680 hp) BMW 801 G-2 engines without any changes to the airframe. It was originally intended that both would be known as A models, but the naming was later changed: the Ju 188A model powered by the 213, and the Ju 188E by the 801. The first three production Ju 188 E-1 machines were delivered with the BMW engines in February 1943, another seven in March, and eight in April. A conversion testing unit was formed up in May, and after testing were attached to an operational unit, with the first mission, an attack by three Ju 188E-1s on a factory in Lincoln, Lincolnshire taking place on 18 August 1943. By the end of the year, 283 Ju 188s had been delivered (including Ju 188Fs), and two new factories were added to the production effort. Most operational machines differed from the prototypes only in having a 20 mm MG 151/20 cannon in the nose and dorsal turrets in place of the 13 mm (.51 in) MG 131. The MG 131 I was intended to be used in the Ju 188 E-1 or the G-2. But the heavy armament in the A and E series was the MG 151/20. The Ju 188 E-2 was built as a torpedo-bomber, but was identical to the Ju 188 A-3. Although the A and E models were to have been delivered at the same time, the Jumo engine was still having difficulties getting into production. Nevertheless, the first Jumo powered Ju 188 A-1 versions were shipped only shortly after the BMW versions, albeit at a much slower rate. By the time delivery rates were finally picking up in late 1943, the Jumo was available in a new MW 50 methanol-water injection "boosted" version that delivered 1,648 kW (2,241 hp) for takeoff. With this engine, the planes were known as the Ju 188 A-2, and started deliveries in early 1944. 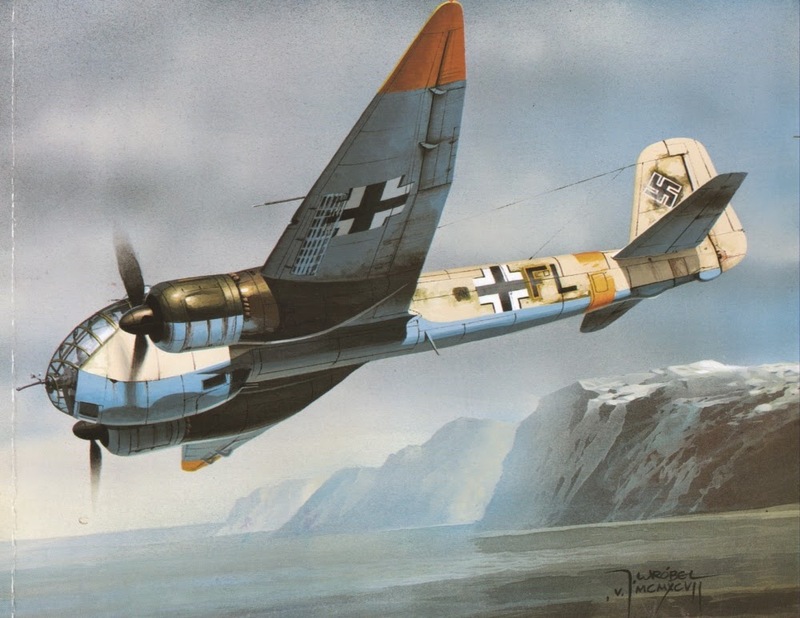 A modified version mounting a small FuG 200 Hohentwiel sea-search radar set under the nose and shackles for a torpedo for naval strike missions was delivered as the Ju 188 E-2, and with the Jumo as the Ju 188 A-3. The only other difference was the removal of the outer pair of wing bomb shackles. For all its good points, the Ju 188 was only a small improvement over the Ju 88 it was supposed to replace. The bombload and bomb bay was no larger than the earlier plane, so although it could handle a larger load by mounting externally, doing so hurt performance. Even then the performance was rather poor considering all the effort - only 523 km/h (325 mph) or less. The dorsal turret had only one gun in it, yet the type retained the single-gun flexible position only a few centimeters away from it. In the meantime, the various projects to finally provide the plane with real tail armament were all abandoned. Delivery problems of the Jumo were never entirely sorted out, and the only model to be built in large numbers were the E series with the BMW 801. Even then so few were available that they were generally given out to Ju 88 units, who flew them on "special" missions where the longer range or better performance would be helpful. Some 500 Ju 188A and E variants were built up until the summer of 1944, when production ceased. 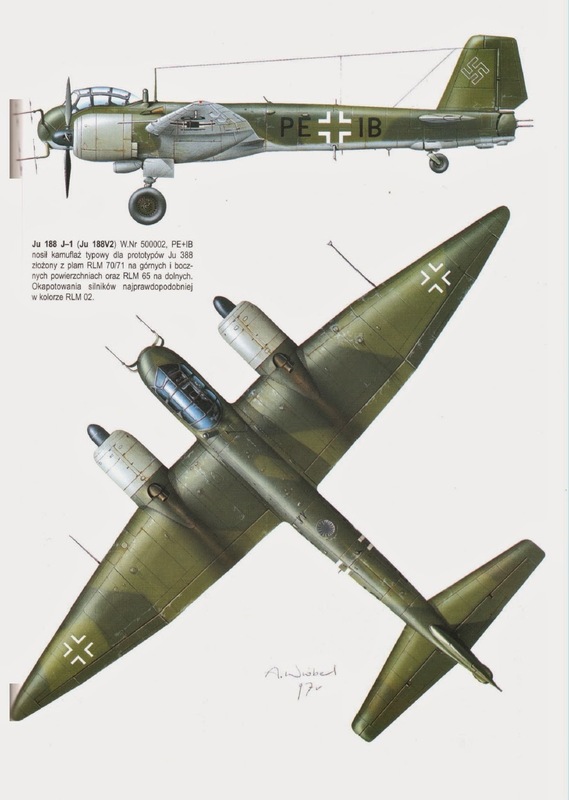 It was planned all along to skip over a "B model" to avoid confusion with the original Ju 88 B, but in the original planning the A and E models would both be called A's. The Ju 188 C would thus be the next model in line. The C series was built to the extent of a single example, by modifying one of the few A-1 machines. To this, they added the new power-operated FA 15 turret in the tail. The turret mounted two 13 mm (.51 in) MG 131s, aimed with a double-periscope (top and bottom) system mounted in the cockpit. This modification would have greatly improved defensive firepower, always lacking on German designs, but reliability was so poor it was decided to abandon the system. In early 1944, it was decided to focus on reconnaissance versions of the A and E models. The airframe was modified with the removal of the bomb aimer and the forward gun, and additional fuel cells were added to extend the range to 3,400 km (2,110 mi). The Ju 188 D-1 was otherwise similar to the A-1, and the Ju 188 D-2 fitted nose radar for naval reconnaissance. Similar conversions of the E models were the Ju 188 F-1 and Ju 188 F-2. One problem with the Ju 88 that carried into the 188 was the lack of internal room for bomb storage. Both carried the majority of their bombload on the outside of the plane on racks under the wing, where it greatly affected performance. This was to have been addressed in the G and H models, which extended the fuselage downward for more room with the addition of a wooden pannier. This modification also left enough room at the tail to fit a manned turret in place of the C model's remote-control one. However this system proved to be just as limited as the remote-control FA 15, being so small that only gunners could fit into it, and had basically no ability to escape in an emergency. The RLM rejected the manned design and planned on mounting the FA 15 even if it were unreliable. Oddly, the designs still had the nose area extended under the plane for a rear gunner, when this would no longer be needed and its removal would have greatly cleaned up the lines of the plane. 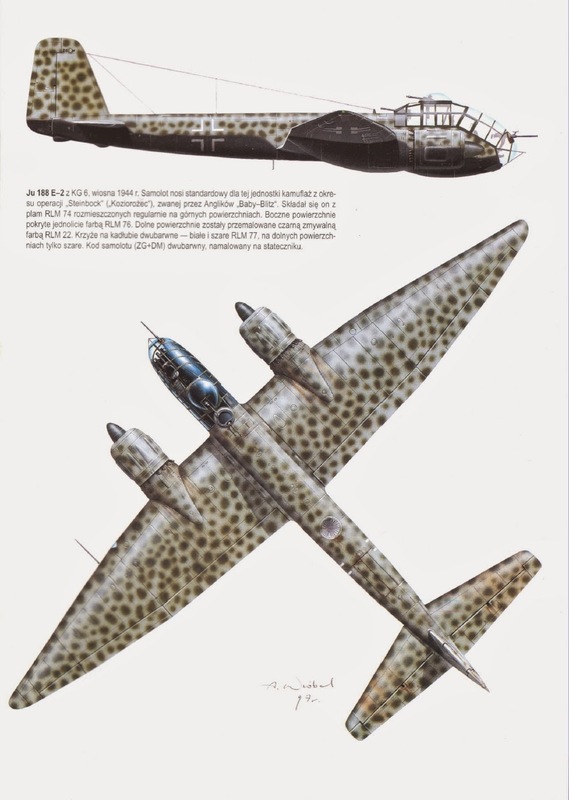 With the Jumo 213s now being sent to fighter production, the Ju 188 G-2 was to use the BMW 801 only, with the reconnaissance conversion known as the Ju 188 H-2. Neither entered production before the war ended. In the summer of 1944, three E models were modified as night fighters with the addition of radar and either four 20 mm MG 151/20s or two 30 mm (1.18 in) MK 103 cannons in the nose. However, the added visibility of the 188 was not useful in the night role, and because the added drag of the radar washed out any speed difference, the Ju 188 R-0 was not ordered.